Mercenary Geologist Mickey Fulp shares what metal has stood out to him in 2018. He also discusses his best investment so far this year and an investment strategy to consider right now. The year is nearly over, and at the recent New Orleans Investment Conference Mercenary Geologist Mickey Fulp shared his thoughts on the resource space. 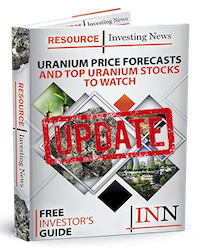 “I think the [commodity] that’s stood out in terms of a bullish market is the recovery of the uranium market,” said Fulp. He added that prices have seen “a very good stepwise rise,” increasing steadily from about $22.50 per pound in April to over $28 currently. He believes macro factors such as the US/China trade war are responsible for that price activity. They have “allowed speculators who are bearish to come in the market,” said Fulp. “I think the supply/demand fundamentals for … the base metals, especially copper, remain strong, but they’ve really underperformed because of shorts in the market. [The] same thing happened with gold,” he added. The yellow metal has also been impacted by US dollar strength. Listen to the interview above for more insight from Fulp, including his best investment so far this year. You can also click here to see the full New Orleans Investment Conference playlist on YouTube.